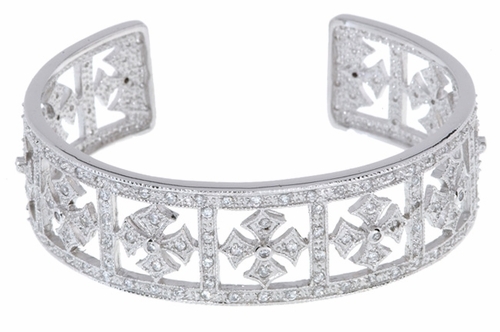 Our Royal Crown Pave Cubic Zirconia Maltese Cross Cuff Bracelet is a work of art, if we do say so ourselves. This wonderful cubic zirconia bracelet is a piece of art that will be worn on your wrist and measures 18mm wide or about 3/4 of an inch. It is a weighty piece that features a royal cross motif that are adorned with pave and bezel set Russian formula high quality cubic zirconia hand cut and hand polished gems with a total carat weight of approximately 5 carats. This is not an ordinary piece of jewelry, it is designed for the woman who can appreciate fine detail and beautiful design. 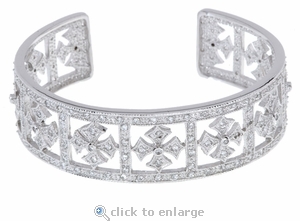 This cuff bracelet is designed to a standard 7 inches and is available in your choice of 14k white gold, 14k yellow gold or luxurious platinum. For further assistance, please contact us directly at 1-866-942-6663 or visit us via live chat and speak with a knowledgeable representative.